"If you believe you can, or if you believe you can't... you're right!" Your life is a reflection of your beliefs which are the cumulative effect of subconscious life-long 'programming' whether positive or negative. PSYCH-K provides a fast and user-friendly way to rewrite the "software" of your mind by changing beliefs that limit you into beliefs that support you. When you rewrite the "software" of your mind, you change the "printout" of your life. PSYCH-K Works with all emotional, health, and life challenging issues. Safaya is available for one to one in person sessions. "YOUR BELIEFS ESTABLISH THE LIMITS OF WHAT YOU CAN ACHIEVE!" 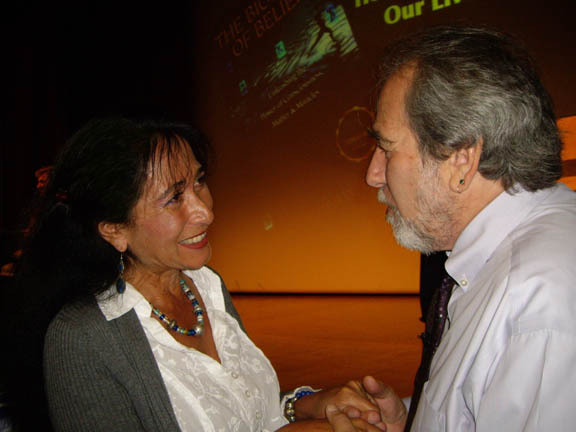 Bruce H Lipton, PhD is an internationally recognized authority in bridging science and spirit. He is an evolutionary leader in the service to 'Conscious Evolution' and a guest speaker on dozens of TV and radio shows, as well as a keynote presenter for international conferences and workshops. Bruce Lipton and Rob Williams, the originator of PSYCH-K, make a compelling case for changing our traditional views of biology and psychology, challenging the prevailing misconceptions of each discipline and provide a logical, scientific and practical way to understand and use these revolutionary new ideas in the video The Biology of Perception The Psychology of Change. When he came to London I had the chance to thank him for his brilliant work! Contact me by email for a session or phone 01453 860706.